Hickman returns in July. No idea on what. Wonder if he will get to do what he wanted to do. I lean towards those rumors being bs. I have trouble imagining the Age of X-man/Uncanny doesn't end with X-books spreading among those writers. 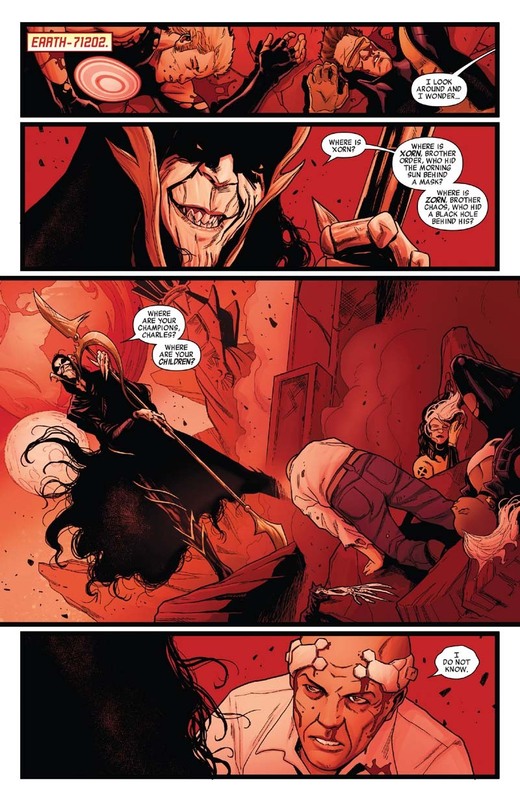 Hickman also supposedly dislikes the X-men. Honestly when he left his interests leaned more towards cosmic. If Guardians hadn't just relaunched I would have guessed he was doing their book. Just let him do the Imperial Guard. If Marvel is going to have a massive crossover the size of War of Realms, at least it's something that's been built towards for years, where a lot of the crossovers seem to make sense given the scope of things, where they seem like they'll be able to stand alone well enough, and where they're using a slew of fun characters. Thor was excellent this week. Ultimate Spider-Man #54-59 written by Brian Michael Bendis, on art is Mark Bagley. Spider-Man and Doctor Octopus find out there’s going to be a Spider-Man movie. Both get involved for differing reasons. I didn’t like this, felt indulgent. I didn’t want to see Sam Raimi, Avi Arad, Tobey Maguire and be reminded off those real life Spider-Man films. Ultimate Spider-Man #60-65 written by Brian Michael Bendis, on art is Mark Bagley. Spider-Man goes for medical aid from Professor Curt Connors but leaves some blood residue. Connors asks if he can test the blood and Peter says so. The experimentation leads to Carnage. I liked this story for the Ultimate line of Carnage and the talk between Mary Jane Watson and Gwen Stay now that Gwen knows he’s Spidey – her causing friction between Peter/MJ. Sad seeing what happens to Gwen even knowing it gets undone. Ultimate Spider-Man #97-105 written by Brian Michael Bendis, on art is Mark Bagley. I jumped ahead to this from #66 by reading a plot summary. Spider-Man fights the Scorpion who looks just like Peter Parker. Mary Jane Watson is kidnapped. People thought dead are reappearing. The Clone Saga more so the 1990s is notorious and shouldn’t take away from Gerry Conway’s original Clone Saga from the ‘70s. The ‘90s also gave us Ben Reilly and Kaine Parker. The rest sucked. Here’s the Ultimate’s take on it and I right enjoyed it, there’s a lot to take in. I liked the reasoning for the clones of Peter Parker, the person behind it is surprising and also cruel for his actions and Nick Fury admitting he was wrong about Peter Parker when he ordered Spider-Slayer weaponry to be made. Spider-Man gets thanked publically by SHIELD as he should. Issue #100 has welcome extras in Mark Bagley sketches and a recap of events in the title’s time though one is in the wrong place. With #103, BMB/MB holds the new record for most consecutive issues, 103 passing Stan Lee and Jack Kirby’s 102 issues on Fantastic Four. Impressive stuff. Ultimate Spider-Man #106-110 written by Brian Michael Bendis, on art is Mark Bagley. Daredevil calls a superhero meeting as he wants to kill Wilson Fisk. Spider-Man is there with Doctor Strange, Iron Fist, Moon Knight and Shang-chi. Spidey the sole objector. Spidey is only likeable. A poor story for Mark Bagley to end his consecutive 110 issue run on with Brian Michael Bendis. One of the most remarkable things about their run, to me, is they did 110 issues without a single fill in, and not only did they not skip a single month, they actually did that full run in just over 6 1/2 years. The consistency and pace, especially for Bagley, was incredible. I agree with this. I'd have Bendis/Bagley Ultimate Spider-Man run with Stan Lee/Steve Ditko, J. Michael Straczynski even though he wrote the two worst Spider-Man stories ever and the most underrated in Christopher Yost. Me and you rate Ultimate Spider-Man #13 especially. Awesome issue. It's on the shortlist for my favorite single issue ever. The three I usually waffle between are "Nobody Dies", "Coyote's Gospel" and USM 13. Those are both excellent choices. Severance Package and a few issues of Sandman also definitely are on my list. Aaron and Ewing together should be fun, regardless of the protagonist. Waids history book should be good too. I lean towards those rumors being bs. I have trouble imagining the Age of X-man/Uncanny doesn't end with X-books spreading among those writers. Hickman also supposedly dislikes the X-men. Yeah I kind of accepted it when BC posted it would definitely be X-men related the day after that last post. Honestly, I'm kind of scared and maybe just a bit annoyed since I've liked what I've read of Uncanny and figured all involved would be steering the X-books after the current event. On the other hand I loved most of Hickman's Marvel work so I'm still pretty darn interested to see what he brings to the table. That said there is still a part of me disappointed Hickman isn't working on a cosmic book. I really wanted him to get a cosmic run like DnA. I see this as additive to what Rosenberg is doing. I'm seriously torn on this. Hickman has done a lot of things I like a lot, but so much of his Avengers run felt less like reading a story than like watching the recap video before the blowoff match that it's hard to get terribly enthusiastic. I liked his overall Avengers run, but the general issue was the main Avengers was basically just there to set up building blocks for Secret Wars while New Avengers did the brunt of the interesting character work. Avengers eventually caught up, but it took a good long while. I don't think we will end up with that same issue though since both of these coming books are supposed to be minis. I imagine Avengers works better now as the sum of its whole than how we devoured it monthly. So I dug this out tonight (on the DCU app, so no actual digging) and I had totally forgotten it was also the issue Buddy first went vegetarian.